Some things in life like love, are indeed sweeter the second time around. Hey Sugar, the most trusted, all natural and organic waxing destination across the Philippines, believe so that is why it is up to spread this sweet, (and smooth) love once again with the return of Sweetest Thing Promo. If iPhone 6 units were given away last year, Hey Sugar sweetens it up now with the newest iPhone 7 up for grabs. Anyone can definitely get a chance to win by simply heading onto any Hey Sugar salon nationwide starting from June 8 to September 30, 2017, avail of the exceptional signature services and for a minimum single receipt of Php 500, one gets to have one raffle entry. Three very lucky winners will be taking home the very sought-after prize. 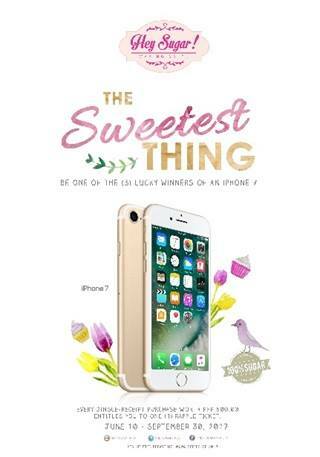 It's going to be the best time to get that smooth and hair-free skin with the Sweetest Thing 2 Promo. Watch out for more updates and exciting promos and giveaways from Hey Sugar! To get more details about the promo, visit www.heysugar.com.ph. Nailaholics SM Fairview is now open!